The 2018 edition of the QS Applicant Survey was released earlier this year, and this month the company has also made available several more specific data slices from the survey, each of which looks at a major sending region. Each of these has to be considered with care as the survey sample covers a wide range of countries within each region. But the sample for Africa and the Middle East – with 5,666 prospective students – is one of the larger respondent cohorts, and it reveals some interesting variations in student decision making and destination preferences that distinguish this diverse region within the wider global context. Also of note, the largest respondent groups in this regional sample came from Nigeria (21%), Ghana (15%), and Kenya (8%). First and foremost among the survey findings, Africa and Middle East respondents are clearly motivated by career goals when it comes to study abroad, and are the least likely – across all global regions – to cite personal or cultural goal as motivational factors for overseas study. “This is potentially related to the higher rates of lower and middle income backgrounds among applicants from these regions, thus making economic incentive a higher priority,” observes QS. The survey also detects a distinct shift in destination preference. The US remains the number one choice, but only marginally so. Its competitive position in the region has eroded somewhat this year, in part because of the current political climate in the US and also due to specific policy initiatives – notably the travel ban affecting several Muslim-majority countries – that directly impact mobility from the region. As the attractiveness of the US has diminished for some students, Canada has grown in popularity and appears now to have effectively replaced the UK as the second most-popular choice for African and Middle Eastern students. As the following chart reflects, students from the region are strongly motivated by career aspirations and the prospect of improved career opportunities. 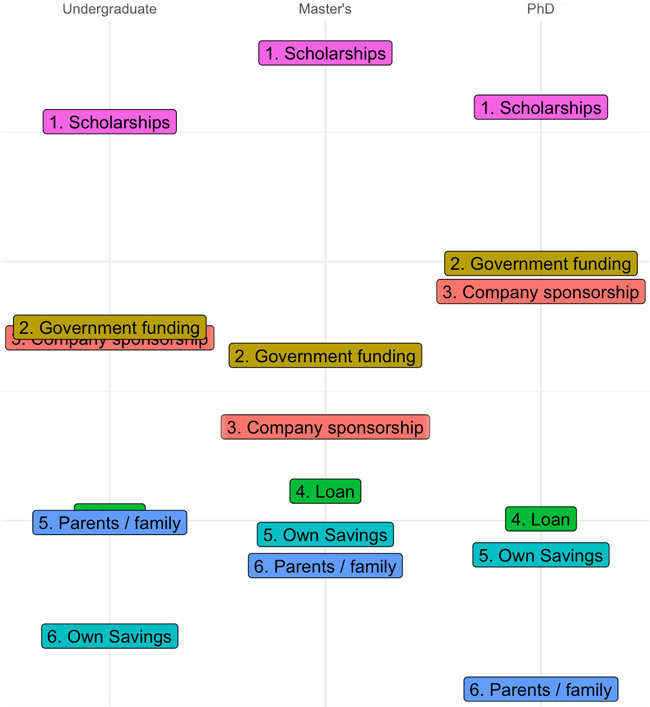 The responses reflected in the chart are for prospective undergraduate students, but the same patterns hold for master’s and PhD students as well. Nearly three in four respondents indicate that progressing to a higher level qualification is an important factor in their interest in pursuing an undergraduate degree abroad. Nearly half see a foreign undergraduate degree as a means of progressing in their current career path, and a similar proportion see a foreign degree as a requirement to enter their intended profession. Finally, almost a third (29%) see study abroad as a way of improving their career prospects. The chart illustrates clearly how weighted the survey response is to these factors, relative to personal or cultural motivators such as opportunities for exchange or personal interest. The US remains a leading destination for students in the region, and is still ranked by prospects as either the first or second choice (with some variance by level of study across undergraduate, master’s, and PhD candidates). In this year’s survey, almost the same proportion of students noted Canada as their preferred choice (that is, the same percentage as those who said they would choose the US), and Canada is rated as the first choice overall for both undergraduate and PhD candidates from the region, with the US a very close second in both cases. The UK, meanwhile, is consistently pegged as the third-ranked choice for students at all levels. In terms of the factors informing those preferences, more than half (52%) cited the availability of scholarships and financial aid as an important element in their destination choice. This was followed by “international recognition of qualifications” (30%), “would like to work there afterwards” (30%), and “affordable cost” (23%) as major decision factors for prospective students. Nearly six in ten prospective students look to education agents for assistance in identifying and exploring options for study abroad. But the QS survey clearly indicates that most students make heavy use of online channels as well, particularly organic search, institutional websites, school selection sites, and social media. Between 80% and 100% of survey respondents said that they make extensive use of all of these online tools. The other striking aspect of student mobility from the region is the prominent role played by third-party funders, particularly in the form of government or corporate scholarships. As the following graphic reflects, personal or family funding plays a lesser role for many students from the region. The ranking of funding sources illustrated here reflects the prominent role of third-party funders (and also the importance of affordability factors) that we have observed elsewhere for key markets in the region, notably Nigeria, Kenya, and Ghana. This entry was posted in Africa, Agents, Higher Education, Middle East, Regions, Research and tagged study abroad, student recruitment, tertiary education overseas, colleges with international students, student mobility. Iran’s university enrolment is booming. Now what?